Most of the classes I teach during the holidays feature the festive…sometimes labor intensive…foods that most of us associate with the weeks between Thanksgiving and New Year’s. But occasionally I tuck in a class that is all about making the season a little bit easier on the cook. Next week I will be teaching a class with a slate of quick weeknight meals. This week I taught a class featuring foods to make or keep on hand when your house is filled with out of town guests. One of the recipes in the class was for a strata filled with kale and Italian sausage. I think perhaps a lot of people have grown up with stratas…often called a breakfast casserole…. But I did not. I didn’t have a strata until well into my adulthood (and my cooking career). The first one I tasted was one I made—a “savory bread pudding” filled with asparagus and goat cheese. It was delicious. And of course, that’s exactly what strata is…a savory bread pudding. 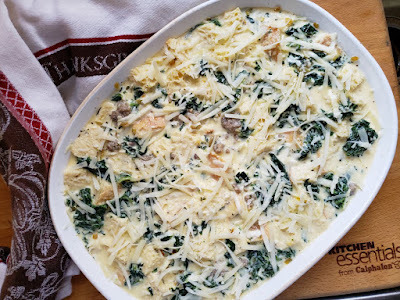 As the word strata implies, traditional versions of this dish are made by layering sliced, stale bread with cooked fillings (meats and vegetables) and cheese. In the version I make, the bread is cubed and tossed (or layered) with the other ingredients. Both styles then get soaked with an egg-rich custard. The dish is left to sit for at least half an hour before baking (so the bread can have a chance to absorb the custard)…and can be left in the fridge overnight. And therein is the thing that makes it so appropriate for feeding houseguests. You can make the whole thing ahead—and whether you are feeding it to people for breakfast, brunch, lunch or dinner (it is appropriate for all of these), when you are ready to eat, you just pop it in the oven. It’s ready in an hour—during which time you can do other things with your guests—or make something simple to serve with it (green or raw vegetable salad, roasted potatoes, etc.). 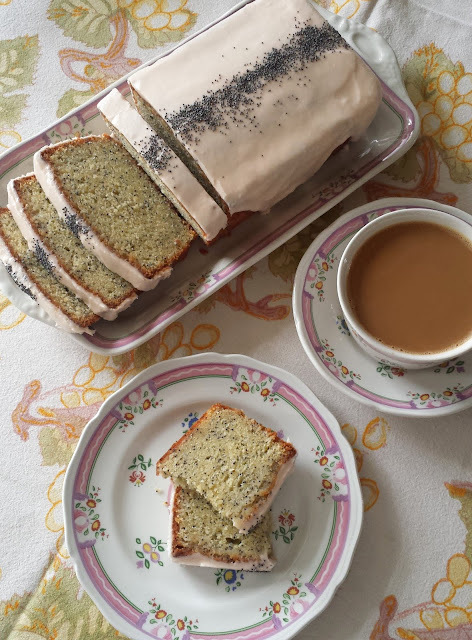 In my classes, I always teach specific recipes—but the recipes are often intended to be a vehicle for teaching basic techniques, standard methods and classic formulas/ratios. To my mind, this is how I can best help people to learn how to really cook. 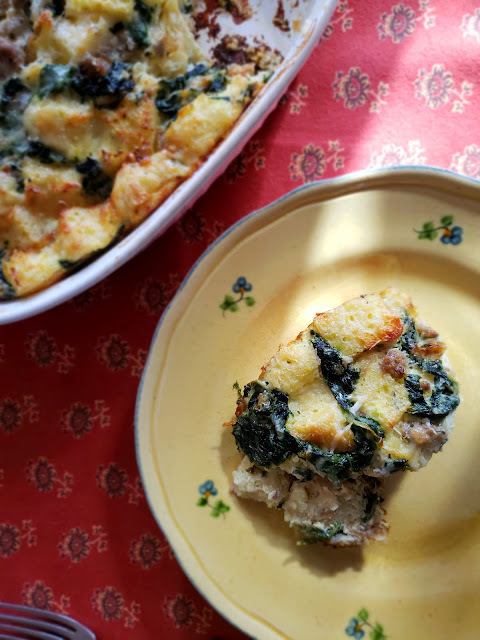 So I was especially pleased when, while working on my strata recipe, I ran across a post at epicurious.com about how to make a strata without a recipe. The author of the article offered a basic formula for the components of the dish, along with an outline of how to put it all together. I don’t agree with her on all the details, but I think the article is excellent and definitely worth reading. The basic idea presented in the article is that you can ratio all of your components from the volume of your bread. I have adapted the formula to suit my preferences as follows: For every cup of bread, I add a half cup of cooked fillings, a quarter cup (1 oz.) of grated cheese, and 1cup of custard. The custard is of course just a mixture of eggs and dairy. You will find stratas that have as little as 2 eggs for every cup of dairy…and some that have 4 eggs for every cup (basically equal quantities of egg and dairy). The higher the percentage of eggs, the firmer the resulting strata will be. I prefer a slightly softer set and use roughly 2 1/2 eggs for every cup of dairy. As for the dairy, almost every strata recipe I have ever seen uses all milk. But I add just a touch of heavy cream. That first savory bread pudding I made (mentioned above) included a small amount of cream…and it was exceptional. It’s a bit counterintuitive, but that little bit of extra fat makes the strata seem even lighter. 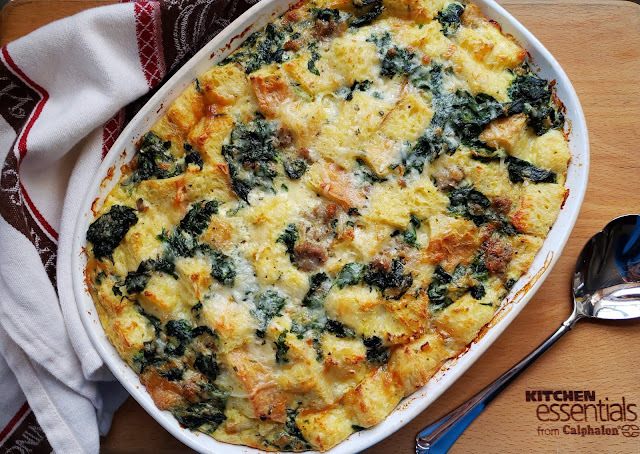 I thought my kale and sausage strata was delicious…and I hope you will give it a try. 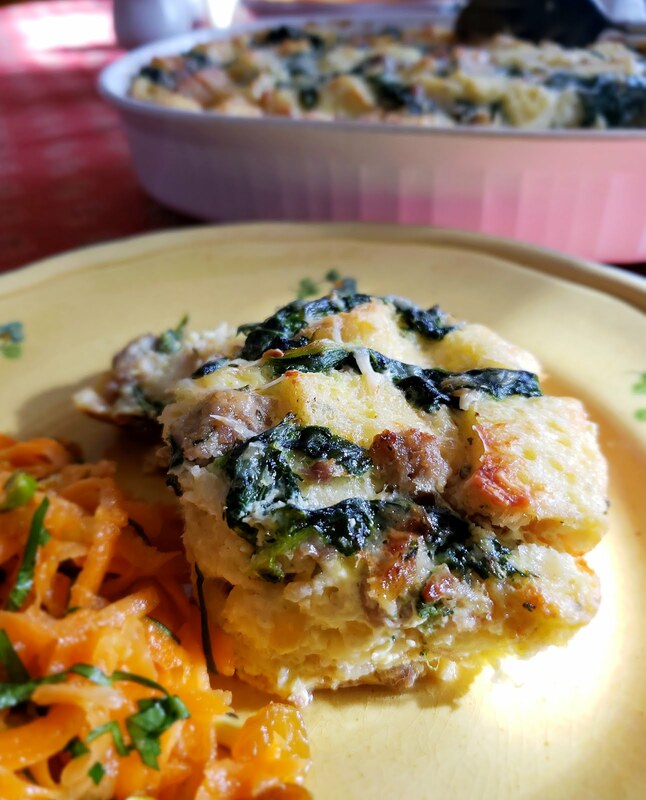 But I hope you will feel free to experiment, using the recipe as a template, too....taking simple things from your pantry—stale bread, eggs, milk, cheese—and using them as a starting point to create a satisfying and delicious meal. Butter a 2 1/2- to 3-quart shallow and wide casserole or baking dish and set aside. Bring a large pot of lightly salted water to the boil. Add the kale and cook until just tender—about 6 to 7 minutes. Lift the kale out of the pot and spread on a baking sheet to cool. When cool enough to handle, gently squeeze out the excess water. Chop very coarsely and set aside. While the kale cooks, place a tablespoon of olive oil in a cold, wide sauté pan. Crumble in the sausage and set the pan over medium heat. Cook, stirring occasionally, until the sausage is cooked through—about 8 to 10 minutes. Using a slotted spoon, lift out the sausage and transfer to a plate. Return the pan to medium heat. Add the onion and rosemary along with a good pinch of salt. Sweat, stirring occasionally, until the onion is tender and beginning to caramelize a bit on the edges—about 10 to 15 minutes. If the pan appears to be dry at any time while the onion cooks (because the sausage was very lean) add a drizzle of oil. When the onion is ready, add the kale and toss/stir to coat in the onions. Let the mixture sizzle and cook for a minute or two to allow the flavors to blend. Set aside to cool. 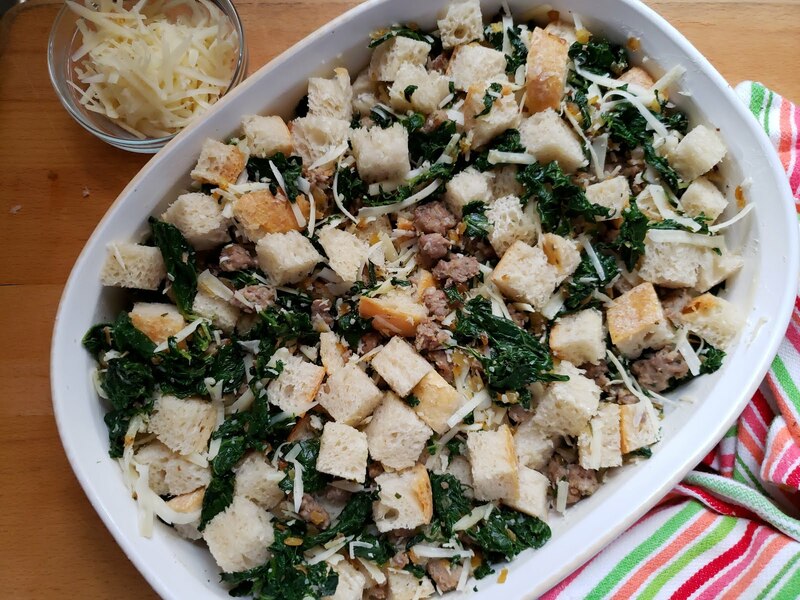 Place the bread, sausage, kale-onion mix, the Parmesan and all but a small handful of Gruyère in a large bowl. Toss so that everything is evenly distributed. Transfer to the prepared baking dish. Remove the plastic wrap and once again, lightly press down on the bread (using a spatula or fork) to make sure everything is submerged or coated in the custard. Scatter the reserved cheese over all. Cover the pan with a buttered and tented piece of foil and transfer to a 350° oven. Bake uncovered for about 30 minutes. Remove the foil until the strata is bubbling around the edges and the custard is set in the center (the tip of a paring knife inserted in the center will come out clean and an instant read thermometer will read between 160° and 180°)—another 15 minutes or so. If the strata is not browned to your liking, run under the broiler for a minute or two (watch carefully so it won’t burn). Let the strata rest at room temperature for 10 to 15 minutes before serving. Serves 8. Substitute 1 1/4 c. diced ham for the sausage. Substitute milk for some or all of the heavy cream. 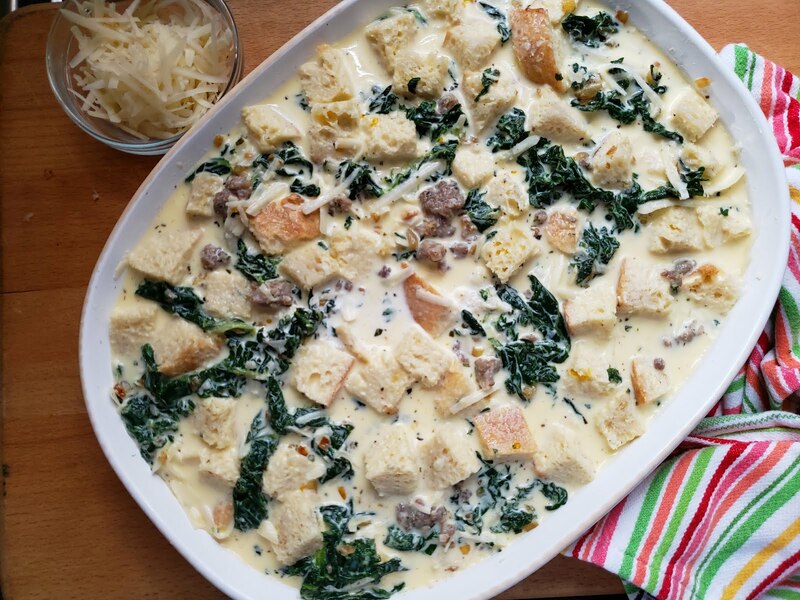 This recipe is a template for any strata. 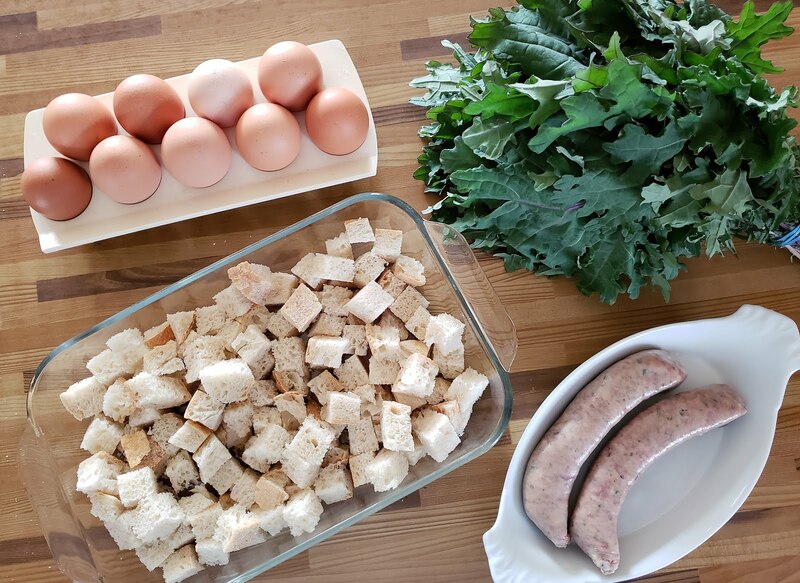 For every 5 cups of bread you will need about 5 cups of custard (eggs and dairy combined) and 2 1/2 c. total mix ins (this recipe has 1 1/4 cup each cooked kale & cooked sausage).